It's not official yet, but I will be speaking at the Dutch PHP Conference in May, with a 3-hour workshop and a regular talk. The schedule will be published next week. Looking forward to meet my telematic friends who will be in Amsterdam. Anyway, here are my new articles published this week. 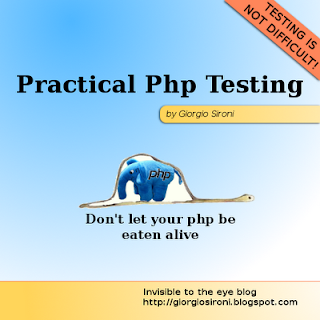 Practical PHP Testing Patterns: Behavior Verification officially introduces Mocks for the first time in this series. Where has XHTML gone? tries to find out which usage this language sees today. Practical PHP Testing Patterns: Custom Assertion explains how to create and manage custom Assertion Methods, which go a long way in making the assert phase of your tests readable and maintainable. Is touch typing mandatory? A survey where you can express your opinion on how to approach a keyboard.